Why Should I Try Baby-Led Weaning? Hi! I’m Katie Ferraro, Registered Dietitian, infant feeding specialist and mom of 7 kids…and I’m a huge fan of a baby-led approach to feeding also called baby-led weaning. Not only is this the most natural way to introduce your baby to solids, but it’s easier, cheaper, safer and way less stressful than traditional spoon feeding. Sounds great, right? A self-feeding baby?! If you look around on the internet or social media and search the term “baby-led weaning” all sorts of results pop up. And it can be kind of confusing since different practitioners and feeding experts define the whole baby-led approach to feeding differently. IF BLW IS CENTURIES old, why am I only hearing about it now? The term “baby-led weaning” was coined by Gill Rapley, PhD, co-author of the Baby-Led Weaning Book and champion of this feeding philosophy. 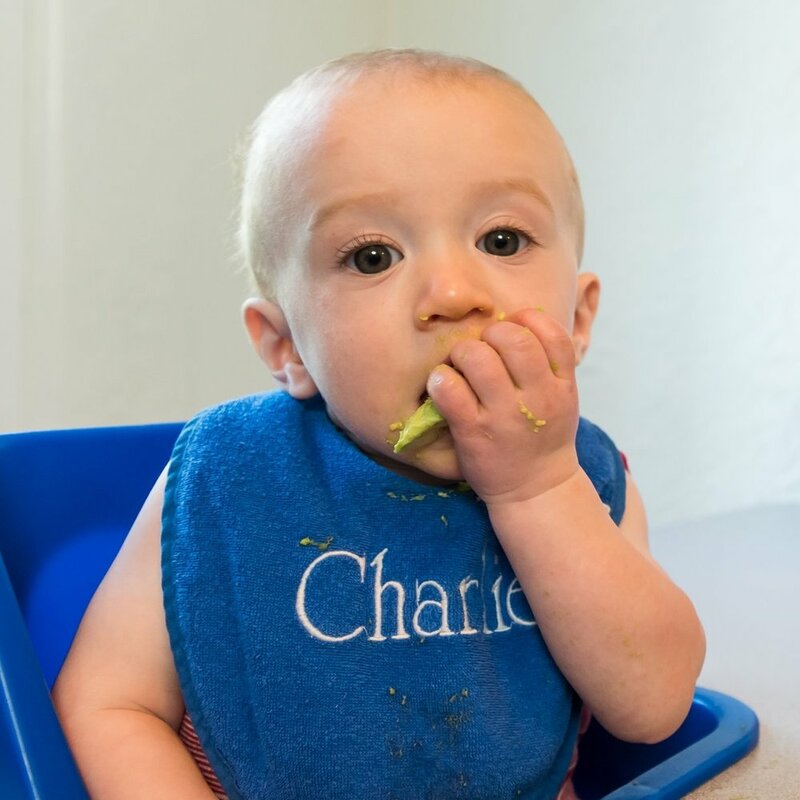 Thanks to Dr. Rapley’s - and others’ - work and research in the field, baby-led weaning has come to be a very popular, and safe, alternative to spoon-feeding purees and starting solid foods. Yes. There is a real and credible body of evidence that shows there is no higher risk of baby choking when starting solids with baby-led weaning as compared to spoon-feeding. Said another way: baby-led weaning does not put baby at a higher risk of choking on food than traditional spoon-feeding does. But there’s one caveat with that research: education. The research that shows BLW is safe is when parents are educated on avoiding high risk choking foods and unsafe feeding practices. Check out some more of my resources on this site and from the links below if you want to learn more about safe feeding. So No Spoons with BLW, Right? Adherents of traditional baby-led weaning practices generally do not advocate for the use of spoons in feeding baby. Other practitioners teach what they call “combination feeding” that includes both spoons and hands in feeding baby. My approach to BLW is slightly different and has been thoughtfully curated through years of clinical and practical experience and out of an over-abiding concern for safety in starting solid foods with baby . Having taught thousands of parents and healthcare providers how to safely do BLW - and after using BLW with 6 of my own 7 children, I now advocate for an approach to starting baby-led weaning called Purees for a Few Days™. My Purees for a Few Days approach to starting solids was designed after working with a speech-language pathologist and feeding therapist to address the issue of establishing baby’s safe swallow first on thinly pureed food, then thicker or lumpier purees and finally the ability to transition to soft solid textured foods. This approach works for parents and caregivers who are not entirely comfortable jumping into solid textured foods when baby has only previously ever swallowed liquid in the form of breastmilk or formula. It is important for baby to master a variety of textures in learning how to eat, including purees. The Purees for a Few Days approach helps establish that baby is safe to swallow the important puree texture before tackling trickier textures generally utilized in baby-led weaning. Well, isn’t that just traditional weaning if you’re using spoons? No. With my Purees for a Few Days approach to baby-led weaning, the parent or caregiver pre-loads a baby spoon with a series of pureed texture foods and then assists or allows baby to self-feed. This differs from traditional spoon-feeding where the parent inserts the spoon into baby’s mouth. This traditional spoon-feeding approach is problematic in that it takes away baby’s ability and desire to self-feed, can increase choking risk, and does not allow baby to listen or respond to his innate hunger and fullness cues. Furthermore, with traditional weaning, spoon-feeding purees by the parent or caregiver goes on for weeks and months (not just days). With traditional spoon-feeding, often the only foods baby tries for months on end are the same small number of iron-fortified rice cereal and watered-down fruit or vegetable purees. This limited repertoire of foods associated with traditional spoon-feeding is particularly problematic as it does not allow baby to recognize his full potential of trying a wide variety of foods, tastes, flavors and textures in the all-important “honey-moon feeding phase” where babies will like and accept all sorts of foods. 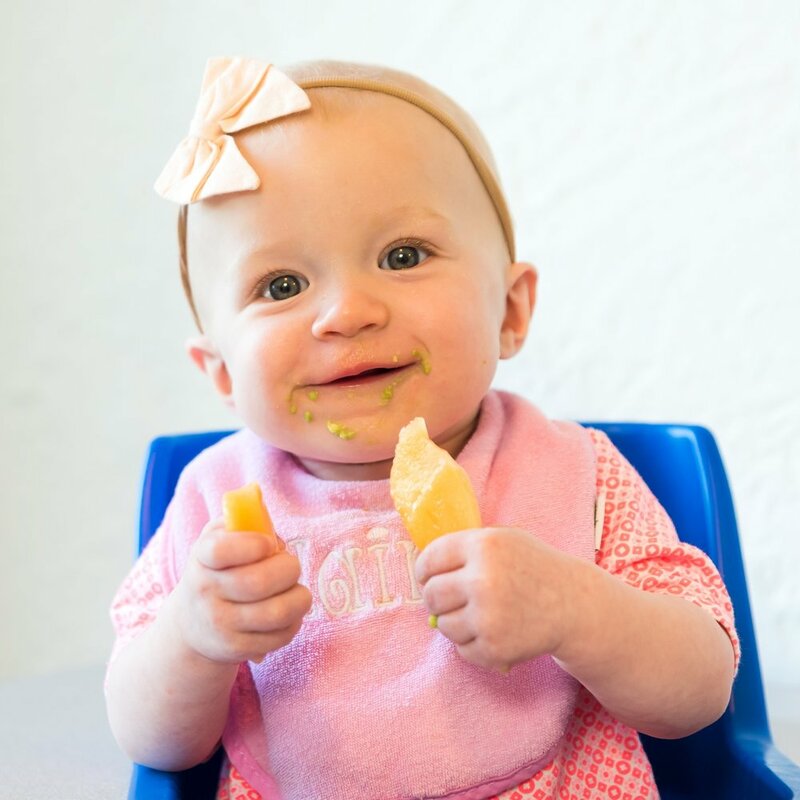 My Purees for a Few Days approach to baby-led weaning allows parents to safely bridge the transition from liquid to solid foods safely, while utilizing the principles of self-feeding associated with traditional baby-led weaning. After establishing that baby can safely swallow thin and thicker pureed foods, I transition baby to traditional baby-led weaning foods: soft, age-appropriate “spears” or “sticks” of food that baby can scoop or rake up by hand and self-feed. Throughout the baby-led weaning process, I continue to advocate for the use of spoons in self-feeding when appropriate. Being able to grasp and eventually utilize a spoon is an important developmental and feeding milestone for baby. There are naturally pureed foods (such as whole milk full fat yogurt and applesauce) that baby can eat by spoon. I recommend offering babies these foods in their natural pureed form and refraining from unnecessarily pureeing fruits and vegetables or other foods that can be offered to baby in their natural, albeit safely altered / cooked forms. Another unique approach to baby-led weaning I incorporate in my teaching is the goal of getting baby to eat 100 foods before turning one. Why 100 Foods for Baby? Research shows us that the greater the number of foods, flavors, tastes and textures baby is exposed to, the less likely she is to become a picky eater. Whereas traditional spoon-feeding of purees severely limits the amount and types of foods and textures baby is exposed to, baby-led weaning allows for infinite opportunities…if you know what to feed. As a Registered Dietitian specializing in infant feeding, my goal is to help parents and caregivers offer their babies as many of the RIGHT types of foods, prepared safely to provide a fun and enjoyable eating experience but also help meet baby’s evolving nutrition needs. And I do this with my 100 First Foods program. Read below to learn more about how YOU can challenge your baby to eat 100 foods before turning one. And if you are on instagram, check out my page @babyledweanteam where I documented the first 100 foods my 6th and 7th babies (twins) Gus & Hannah ate with baby-led weaning. If you are interested in learning more about baby-led weaning, the numerous posts on this site will be of help. For my videos about baby-led weaning click here. For blog post and articles about baby-led weaning click here. I also moderate a free private Facebook group called Baby-Led Weaning Recipe ideas and you can join that group here. Still want more? Read on for the other baby-led weaning resources and training opportunities I have for you! You can sign up for the free online workshop by clicking here. I also give away my list of 100 First Foods to all attendees on the workshop - so sign up and grab your seat today! My signature online course is called the Self-Feeding Baby Course and it is a step-by-step guide for mastering solid foods with baby-led weaning. In this course I take you through the steps needed to safely prepare and offer foods for baby using baby-led weaning. The course contains 15 in-depth training videos as well as 100 BLW recipes and tons of other bonus materials to help you succeed with baby-led weaning. 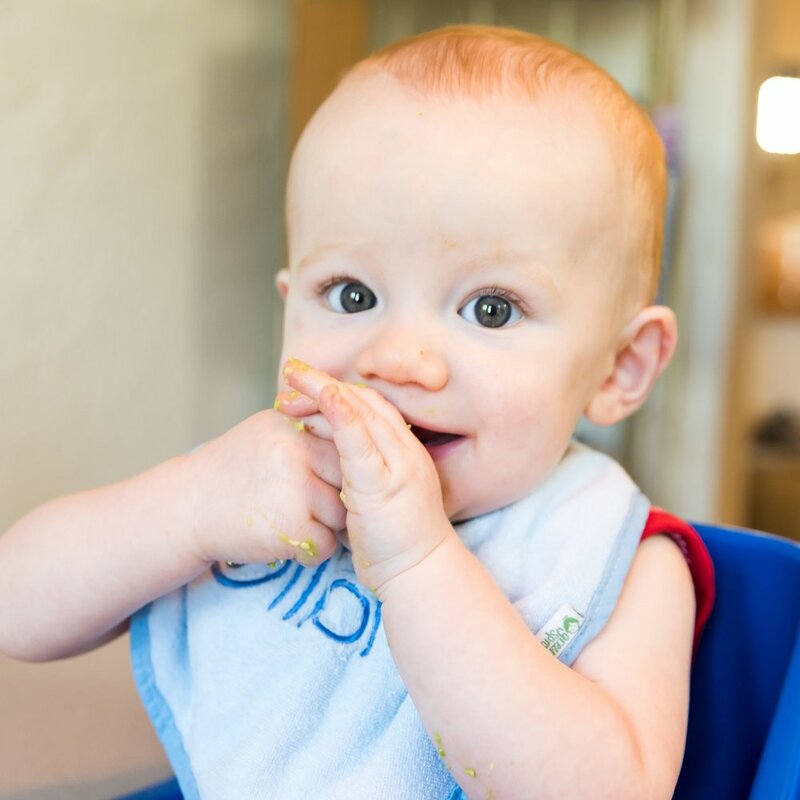 Click here to learn more about the Self-Feeding Baby BLW course. If you are a Registered Dietitian and are interested in learning more about BLW for professional or personal use, I also have a 5 continuing education unit (CEU) course for RDNs and you can access that here. If you’re on the fence about baby-led weaning and feel like you could use additional support or training, check out my membership group The Baby-Led Wean Team. Each week I do exclusive trainings and live BLW question & answer sessions for members. I have exclusive BLW recipes inside of the membership plus tons of downloads, videos and other expert interviews to help you become a confident feeder and to help your baby succeed with BLW. Click here to learn more about the Baby-Led Wean Team membership group. If you would like to learn more about baby-led weaning, check out my e-book The Quick-Start Guide to Baby-Led Weaning. This is a 16-page e-book jam packed with all of the info you need to get started with BLW safely. The guide includes a nutrient deep-dive, tips on seasoning without salt, 10 ideal starter foods and a few combination food recipes too. Click here to get the Quick-Start Guide to Baby-Led Weaning. WILL BABY-LED WEANING WORK FOR MY BABY? If you’re not sure if baby-led weaning is right for you - or your baby - check out my free download "Will Baby-Led Weaning Work for My Baby?” This is a quick tool to help you decide if BLW is the best route of infant feeding for you. Click here for the download. I LOVE instagram and it is an excellent medium for showing parents HOW to do baby-led weaning. If you want to check out my baby-led weaning instagram page, come follow along @babyledweanteam.